FINALLY, SHOW OFF THAT NEW BODY TO YOUR FRIENDS. I was at 33% body fat with high blood pressure (144/96) and high cholesterol. During my fitness journey, I suffered from three biking accidents. I had open lacerations needing multiple stitches, broken clavicle, collapsed lung and a broken wrist. All of which kept me out of the gym for six months. Through weekly physiotherapy treatments, unique exercises Colin designed with my injuries in mind and most importantly his motivation and support, I was able to achieve my most recent success. I have released 18% body fat, blood pressure and cholesterol are back to normal and I’ve gained 20lbs of muscle. I have trained with Colin for 6 months prior to opening his own gym. If you’re wondering if you should train with him, JUST DO IT! His workouts are never boring as he always switches it up and finds new exercises to do. 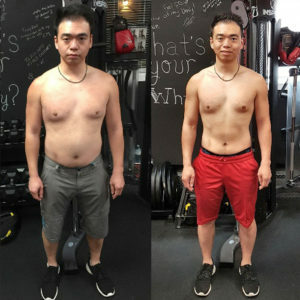 I would highly recommend Colin for anyone who wants to lose weight and build muscle! I started personal training when my sister asked me to be Maid of Honour at her wedding. I realized that I wanted to look good since I was going to be in a lot of pictures. When I first stepped on the scale I didn’t realize how heavy I was and I knew that I needed to change. It has been a hard 3 months as I work 50 hours a week and had to find time to work out in between. After looking at the before and after pictures I can’t believe how much my body has changed and how much stronger I feel. I am not quite at my goal but I know I am heading in the right direction and that I will look amazing in my bridesmaid dress in January! As a kid, I always struggled with my weight. I was always bigger than my friends and it lead to being very self-conscious. As I grew older, it was always easier to take the easy way out, the lazy way. The weight kept going up until one day as a 39 year old man, I finely said enough is enough. I started this 90 day challenge as something to do with my wife but soon found out that I needed to do this for myself, it wasn’t just something to do to spend some QT with my wife. The last 90 days was not easy but with the support of my loving wife and my awesome trainer, Colin. I finely had the drive and support to lose the weight. 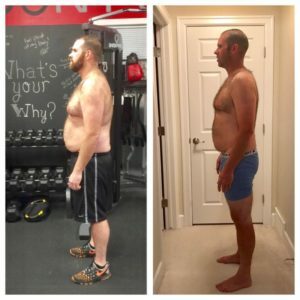 90 days, 20 lbs. & 14 ½” later, I am in the best shape since my early 20’s. My journey in not over yet, I now have the motivation and the support to continue until I reach my ultimate goal. Being at a healthy weight and a healthy state of mind is where I want to be for my family and for myself.